The Yeakel Cemetery can be difficult to find. It’s not visible from any road and is surrounded by private property. As indicated in deeds going back to 1802, there is an easement of 10 – 12 feet wide leading to the graveyard from Stenton Ave. and for over 200 years visitors have taken this path to the cemetery. Today, visitors must go to the rear of a rehabilitation center at 8833 Stenton Ave. Wyndmoor PA and find the path leading to the cemetery. 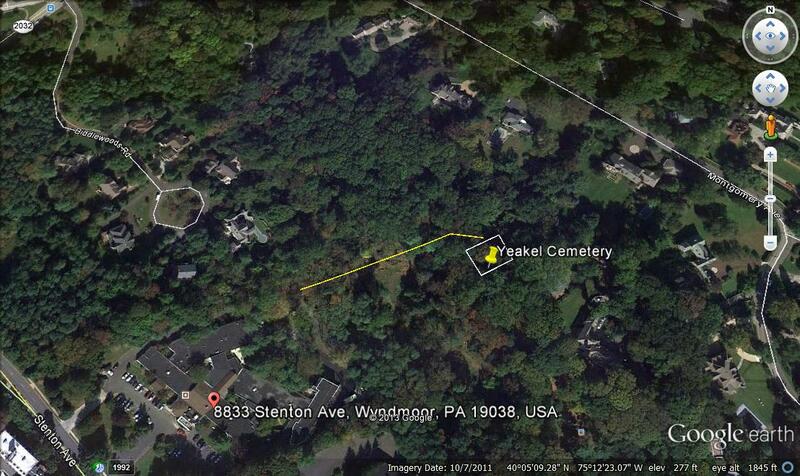 This image shows the path, in yellow, going from the rehabilitation center to the cemetery. This path is hilly and often has high grass, so use caution. Click on the image for a larger view. Use this map feature to find 8833 Stenton ave.